Despite her enviable skills, pianist Angelica Sanchez has maintained a relatively low profile since relocating from Arizona to New York in the mid-1990s with saxophonist Tony Malaby. In addition to numerous collaborations with Malaby, Sanchez’s sideman credits include work with peers like Matt Bauder, Harris Eisenstadt and Rob Mazurek – though her output as a leader has been somewhat limited. Other than Mirror Me, her 2003 Omnitone debut, the only other title in Sanchez’s discography as a bandleader is Life Between (Clean Feed, 2008) – the phenomenal premier of her Quintet with Malaby, renowned French guitarist Marc Ducret and the stellar rhythm section of bassist Drew Gress and drummer Tom Rainey. Wires & Moss, the band’s sophomore effort, expands upon its predecessor’s deft equipoise, gracefully shifting between open forms and taut written sections. 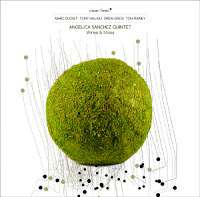 Sanchez’s elegant melodies provide boundless inspiration for her bandmates, facilitating a wide range of individualized expression – especially from Ducret. The guitarist’s dynamic versatility manifests in myriad ways, from the glassy fretwork that underpins the dolorous ballad “Feathered Light,” to the metallic shards and searing maelstroms that dominate the remainder of the album. His introductory soliloquy to the title track unveils the breadth of his wide-ranging approach; he uses fretboard hammering, whammy bar pitch bends and sustained feedback to extrapolate the tune’s sinuous melody into a multitude of abstract variations. Selectively underpinning Ducret’s salvos, Sanchez demonstrates her mettle as a discerning accompanist whose keen understanding of dynamics provides the group with spacious vistas to explore. Her harmonically unfettered melodic sensibility and pellucid touch imbues the session with robust lyricism, whether plying delicate filigrees on the unassuming “Feathered Light,” issuing cascading neo-classical figures on the expansive title track, or closing the knotty opener, “Loomed,” with a stately cadenza. Building on years of familiarity with her oeuvre, Malaby’s contributions to Sanchez’s work are deeply affecting. His tender soprano regales with understated sensitivity on the title cut, while his pneumatic tenor fusillades amplify the dramatic contours of “Bushido.” His commitment to Sanchez’s artistry is most telling on “Soaring Piasa.” He invests the rousing melody with soulful ruminations that gradually ascend with irrepressible urgency, inspiring the band to greater heights of controlled fervor. Veterans Gress and Rainey gracefully navigate stop-start rhythms, unconventional meters and impressionistic accents, their practiced rapport providing magnanimous support. Buoyed by her illustrious sidemen’s stirring interpretations, the vivid panoramas revealed on Wires & Moss are among the most satisfying of Sanchez’s burgeoning career.